Costume of korowai (Māori cloak), hei tiki (greenstone figural pendant), kuru (greenstone ear pendant) in one ear, shark tooth ear pendant, and tokotoko (carved wooden genealogy stick). Wiremu Pātara Te Tuhi, Ngāti Mahuta. Costume of korowai (Māori cloak), hei tiki (greenstone figural pendant), kuru (greenstone ear pendant) in one ear, shark tooth ear pendant, and tokotoko (carved wooden genealogy stick). 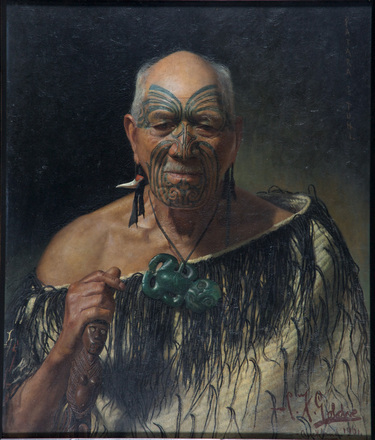 Goldie, C. F. (1901) Pātara Te Tuhi, an Old Warrior. Auckland War Memorial Museum - Tamaki Paenga Hira. PD-1951-1-7. Wiremu Pātara Te Tuhi (b? 1822 - 1910) was from the Ngāti Mahuta of Tainui. Pātara advocated for armed resistance to colonial rule, editing the Kingitanga pamphlet Te Hikioi and engaging in military actions in Waikato in the 1860s. After the end of armed conflict in 1864 Pātara joined King Tawhiao in exile in Ngāti Maniapoto territory, accompanying him to England in 1884 to petition Queen Victoria. Te Ara biography. See also Blackley (1997) pp. 188-90. First shown at Auckland Society of Arts exhibition 1901. No list price. 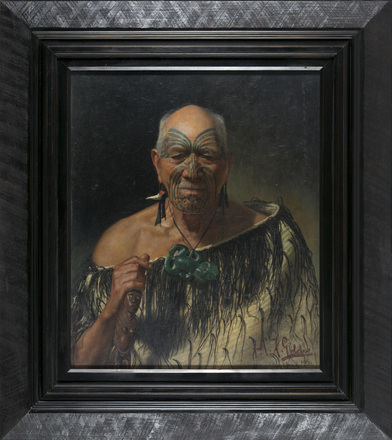 One of two portraits of Pātara Te Tuhi by Goldie in the collection. see PD-1951-1-8.